I made a pot of chili recently and instead of just eating a bowl of it for leftovers, I threw all dietary concerns out the window and smothered a platter of french fries with it, then topped it all with cheddar cheese! This batch of chili was really tasty and I had eaten a couple of leftover bowls the previous day. It was time to mix it up a little and add some tasty little french fries to the equation. I always keep a bag of frozen french fries in the freezer as a go-to side if I need. This might not be the prettiest or healthiest dish around, but man was it tasty! Cook french fries according to package directions. Preheat chili in microwave or stove top. 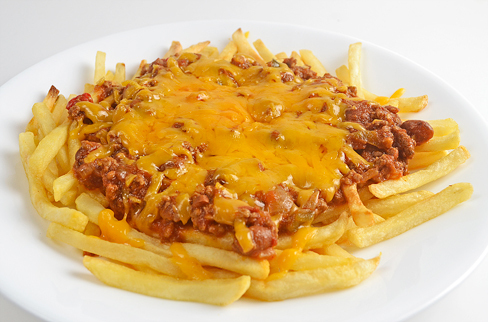 Pile fries on a plate, top with chili and cheddar cheese. 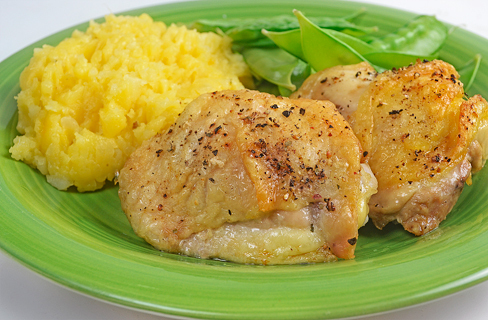 Heat under broiler or in a microwave until cheese is melted, then serve. I always have a bag of frozen buffalo chicken tenders in the freezer. One bag will make several lunches. They are mandatory in any single man's kitchen. This isn't a gourmet recipe for all the foodies to marvel over. This is a simple lunch that is easy to make. And — it's really tasty! I could make the buffalo chicken tenders myself from scratch, but that would take way more time. This is a go-to lunch when I want something tasty relatively quick and without a mess. These could be sprung on anyone for a casual lunch and I bet they would be impressed. It features crispy breaded chicken tenders with the signature buffalo flavoring and blue cheese dressing. 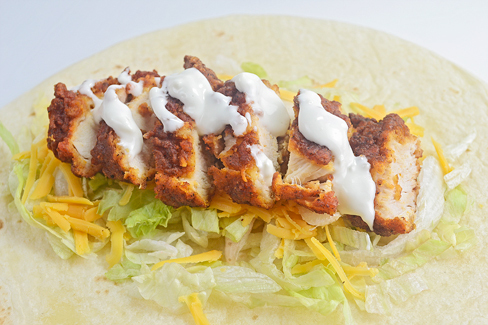 The cheddar cheese and lettuce help with extra flavor and really fill out the wrap for a little bit more heft and to give it a sandwich feel. Sometimes I even throw a handful of frozen french fries on the sheet when I cook the tenders for a side dish! In my world not every meal can be a gourmet culinary adventure, but I do try to get creative with flavors and products whenever possible. Let chicken cool slightly then slice. Divide ingredients among 4 wraps. On tortilla layer lettuce, cheese, chicken the blue cheese dressing. Tuck both side of tortilla then roll into a wrap. Slice diagonally through middle, then serve. I saw that ribs were on sale shopping at Meijer last Saturday, but to my disappointment, they were spare ribs. I prefer baby back. As I was looking at the cooler full of ribs, I noticed a lone rack of baby backs in the pile. I grabbed them for a closer look and sure enough, the rack was priced the same as the spare ribs! It was my lucky day. I threw it in my cart and off I went. I had already planned a meal for that evening but I decided that I would cook the ribs that night, then finish them on the grill for lunch the next afternoon. It's a technique I learned while being a prep cook at the Texas Road House. I did a variation of that technique for these ribs. First a rub is liberally applied, then the ribs are wrapped in foil. I then bake the ribs for 90 minutes. At this point they can be cooled and refrigerated or taken right to the grill for the finish. I put mine in the fridge for the night and grilled them the next day. The grill not only heats the ribs through and flavors them with a grill flavor, but this is when the barbecue sauce is applied. The heat will help caramelize the sugars in the sauce, which for me is the icing on the cake. 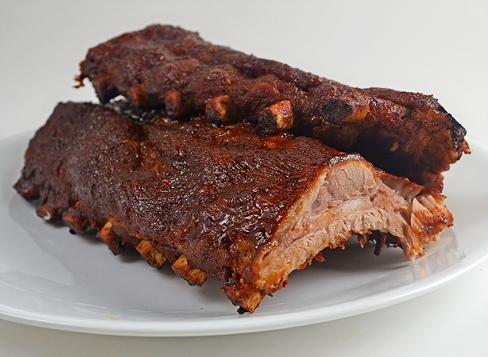 I busted out some of Steve's Oink-n-Squeel barbecue sauce for this rack. It's made in Evansville, Indiana by a work collegue's father. I love its flavor and it has the perfect consistency for basting meat over the flames. It took 15 minutes to heat the ribs through and get some caramelization of the sauce. The end result was a juicy, tender and well flavored rib — which made a mess of my hands and face — but most importantly filled my belly. Thoroughly season ribs with rib rub on all sides. Wrap in aluminum foil. Place on baking sheet fitted with baking rack. When oven is ready place on in center. Let ribs cook for 90 minutes. Remove ribs from oven let cool. Can finish on grill at this point or refrigerate in foil for a day or two and finish later. Remove ribs from foil, slather with BBQ sauce and sear on grill until sugars in sauce caramelize, turn once or twice, basting with more sauce. 10 to 15 minutes. Remove from grill and serve. Mix spices together. Store in a container with a tight sealing lid. For the first time in a long time I spent my Saturday doing odd jobs around the house and watching college football. It was an unusually cool day for September. Perfect weather for a yummy pot of chili to cook and grub on while watching the action on the grid iron. For my seasoning I replaced chili powder with chipolte sauce, which is found in the international isle with the Mexican cuisine at about any major grocery chain. The sauce is basically a stew of chipolte chilis (smoked jalapeno), onions, garlic and tomatoes. It has a nice smoky heat and is already a well developed flavor in and of itself. For extra boost, I also added cumin and oregano. 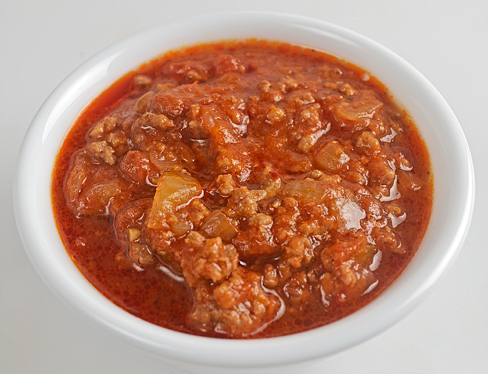 I prefer chili without beans, but when I grabbed the package of ground beef from the freezer earlier in the day to thaw, I realized it was only a pound and a half. Usually, I make it with 2 pound packages. To help the chili go further I added a can of chili beans that I had had lurking in the cupboard for some time. The beans really did help the dish go further. Once the chili was ready I served it up and never even grabbed a spoon. I used corn tortilla chips to eat every bite. The salty chips turned out to be a great delivery method for the smoky, spicy and beefy mix. It had to have been something — because by the time the football ended — I had devoured 3 bowls of chili and a half bag chips! Season ground beef with salt and pepper, brown in a 4 to 6 quart soup pot over medium heat, 5 to 7 minutes, remove to a paper-towel lined plate. In drippings saute onion and jalapeno until soft, 5 to 6 minutes, season with salt and pepper. Add garlic, cumin, oregano. Cook until fragrant 1 to 2 minutes more. Add chipotle sauce, chili beans, crushed tomatoes, water and return beef to pot. Mix well. Bring to a boil, reduce heat and let simmer until 3/4 of the liquid evaporate and mixture has thickened, 60 to 90 minutes. Remove from heat and serve with corn tortilla chips. This dish was intended to be a soup up until the onions and peppers were literally sauteing. It was at that moment I decided to make it a little more substantial. I wanted this to go a little further and stick to my ribs more than a soup would. That's when I made the executive decision to turn it into a jambalaya-inspired dish. I went to the pantry and grabbed a can of tomato sauce and a cup of rice to throw in the pot. Then I added just half of the broth I was originally going to add because that's all the liquid I would need for the rice. I call it jambalaya, but it's not really cajun or creole in the way it's spiced and it doesn't have any seafood. But this is pretty much how I would go about making jambalaya if I wanted to go that route. What I love about a dish like this is how the rice and liquid congeal to create an almost creamy texture that sees to surround all the wonderful flavors that are the real star of the show. The end result was a hardy and delicious one pot meal. For me, it stored well and was easy to reheat and take to work for dinner. I got 4 servings out of it, so it would be perfect for a family for dinner. This recipe started out as an attempt to get rid of sweet peppers I had bought on sale and wanted to use up before they started to wilt. I really couldn't decide what to make even as I was dicing things up, I was just going the direction of a soup and it evolved into this dish. It was fun just letting it happen. It's as if I started writing a sentence before I knew what the final words would be. I should experiment like this more in the future. In a soup pot over medium heat, brown Italian sausage 6 to 8 minutes. Remove to a paper-towel lined plate or bowl. 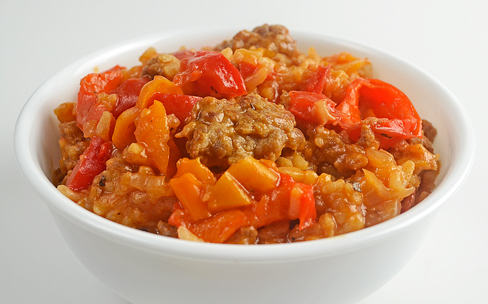 Add sweet pepper and onion to pot and sauté in sausage drippings until soft, 3 to 4 minutes. Season to taste. Stir in Italian seasonings and garlic, cook 1 to 2 minutes or until fragrant. Return sausage to pot and add tomato sauce, broth and rice. Mix well. Bring to a boil, cover and let simmer 15 minutes, turn off heat, let rest with cover on for 10 minutes more. Remove lid and fluff. Rice should have absorbed nearly all liquid and be tender. Scoop and serve. I had never made carnitas. Now, I'll make them all the time! Cooking pork in a citrus liquid made for sensational grub. While the carnitas were cooking I kept sticking my nose over the pot and letting my sense of smell drink in the flavors. It was hard waiting for the pot to finish, but it was totally worth it. The citrus didn't overpower, it added a sweet balance to the savory pork and other seasonings in the dish. From the batch of carnitas I made four servings — tacos twice and two burritos for myself. I harvested the pork shoulder chunks from a bone-in shoulder I picked up on special at the grocery store. I didn't realize it was bone-in until I was ready to start cooking. I wasn't quite sure how to attack it so I went to youtube and watched a video on how to de-bone a pork shoulder. It worked like a charm and I didn't waste hardly any meat. To go along with the carnitas I made a spicy chipotle salsa. I knew I would be eating most of it myself over the next week, so I made it hot, probably way to hot for most people, but I like really bold salsa for my tacos. Removing the seeds and flesh from the jalapeno and chipotle peppers can reduce the heat significantly if a milder sauce is desired. The carnitas and salsa were an evening project on a day off. At one point, I had both pots on the stove simmering away, releasing magical aromas that turned my kitchen air into a yummy potpourri. As I inhaled the stove-top perfume I felt the zen of culinary bliss take over my mind — which made for a great evening of relaxing and eating at home. Cooking and creating the food that keeps us alive can be a true pleasure, these dishes were exactly that for me. In a large pot, over medium-high heat brown pork in a little oil or lard on all sides. Work in batches if necessary, season to taste. Remove pork and add onion, cook until soft 4 to 6 minutes, season to taste. Add garlic, oregano and bay leaf, cook 1 minutes more or until fragrant. Return pork to pan and zest and juice from oranges, pineapple juice and water. Bring to a boil, cover and reduce heat. Let simmer 2 hours. Remove lid and cook liquid out, 45 minutes to 1 hour more. Monitor closely toward the end. Remove from pot and serve. 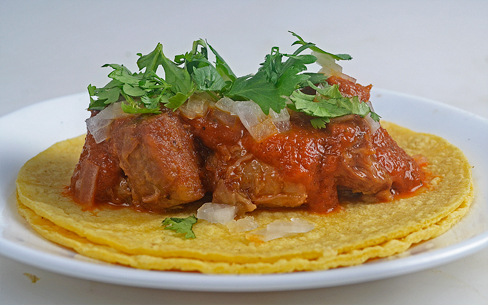 For Tacos I served carnitas with corn tortillas, onion, cilantro and salsa (recipe follows). In a soup pot over medium heat, saute onion and jalapeno in a little oil until soft, 3 to 4 minutes. Season to taste. Add oregano and garlic, cook until fragrant or a another minute or two. Add pineapple juice, vinegar, Worcestershire sauce, chipotles in adobo sauce and water. Bring to a simmer and let cook for an hour or until liquid has reduced by 3/4ths. Let mixture cool for a bit then pour in blender add cilantro, zest and juice of lime. Blend until smooth, 4 to 6 minutes. Adjust seasoning if necessary, then serve. This was the third and final dish created from a family pack of chicken thighs I got for under $5, and by far my favorite of all three! I love chicken salad for easy lunches and usually make it with leftovers. I just mix chicken with mayo, pickle relish, onion and celery and whala! I have a tasty filling for a sandwich. I prefer making it with grilled chicken just for the extra smoky grill flavor that comes through in the salad but any type of cooked chicken works, here the chicken was roasted. This time I decided to replace the relish with pickled mild banana peppers. I ate a burger recently that featured them as a topping and I have been experimenting with them ever since. Their addition to chicken salad was an absolute home run. The peppers pack so much flavor and really give the spread a nice tang and vinagery heat. This batch made enough for two huge wraps that I ate on consecutive days for lunch. It's hard to not have food go to waste when cooking for 1. This time I was efficient and made some delicious food from a bargain priced family pack and nothing got thrown away. That's a win for the single cook! In a bowl, mix together all ingredients until thoroughly combined. Cover and store in refrigerator for an hour to let flavors meld. 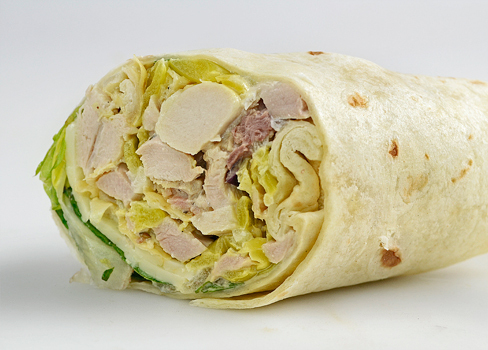 Place Chicken salad, cheese and lettuce in the center of a large toritilla. Fold in sides and roll shut. Slice in half and serve. This was an "in between" meal for me. I purchased a 5 lb package of bone-in chicken thighs on sale for 87¢ per pound. Half of it I de-boned and made into green bean chicken stir-fry. The other half I roasted and shredded for chicken salad. Instead of shredding all of it, I grabbed two of the perfectly cooked thighs after they came out of the oven to enjoy for lunch and the end result was this plate of food. While the chicken roasted, I made the cheddar potatoes. I steamed them in the microwave and mashed with cheese and unsalted butter. I didn't have any milk or cream to fluff them up so I couldn't call them actual "mashed potatoes" but they were tasty and a great compliment to the chicken. This lunch took about 45 minutes, which was really just the time it took to roast and rest the chicken. Like I said in the beginning, this is the "in between" meal, nothing fancy. I got creative with the other recipes I made using the thighs. I just couldn't resist eating a couple of them hot out of the oven, the aroma that filled my home was way to much to resist. Preheat oven to 400° Season thighs all over with salt and pepper. Place on a foil lined sheet pan fitted with an oven safe baking rack. Put chicken in center of oven and roast for 20 minutes. Reduce heat to 350° and roast 15 minutes more or until meat in thickest part of thigh reaches 160° on a meat thermometer. Let rest 5 to 10 minutes, then serve. Place potatoes in a microwave steam bag. Season with salt and pepper. Add 1 tablespoon of water to the bag then seal. Place in microwave and cook on high for 8 minutes or until soft and cooked through. Time can vary depending on microwave. Remove from bag and place in bowl. Add butter and cheddar cheese, mash with a potato masher until cheese and butter are melted and all is combined, then serve.